FIP | That's a Clown Hypothesis, Bro! What’s the Point of DIPS, Anyway? In the last piece I wrote, I mentioned that I have some concerns about the way that people tend to think about defense independent pitching statistics (DIPS), especially FIP. (Refresher: Fielding Independent Pitching is a metric commonly used as an ERA estimator based on a pitcher’s walk, strikeout, and HR numbers.) I’m writing this piece in part as a way for me to sort some of my thoughts on the complexities of defense and park adjustments, not necessarily to make a single point (and none of these thoughts are terribly original). All of this analysis starts with this equation, which is no less foundational for being almost tautological: Runs Allowed = Fielding Independent Pitching + Fielding Dependent Pitching. (Quick aside: Fielding Independent Pitching refers both to a concept and a metric; in this article, I’m mostly going to be talking about the concept.) In other words, there are certain ways of preventing runs that don’t rely on getting substantial aid from the defense (strike outs, for instance), and certain ways that do (allowing soft contact on balls in play). In general, most baseball analysts tend to focus on the fielding independent part of the equation. There are a number of good reasons for this, the primary two being that it’s much simpler to assess and more consistent than its counterpart. There’s probably also a belief that, because it’s more clearly intrinsic to the pitcher, it’s more worthwhile to understand the FI portion of pitching. There are pitchers for whom we shy away from using the FI stats (like knuckleballers), but if you look at the sort of posts you see on FanGraphs, they’ll mostly be talking about performance in those terms. 1) If their spot on their team were given to an arbitrary (replacement-level or average) pitcher, how much better or worse would the team be? 2) If we took this pitcher and put them on a hypothetically average team (average in terms of defense and park, at least), how much better or worse would that team be? 3) If we took this pitcher and put them on a specific other team, how much better or worse would that team be? The thing, though, is that pitchers don’t work with an average park and defense behind them. You should expect a fly ball pitcher to post better numbers with the Royals and their good outfield defense and a ground ball pitcher to do worse in front the butchers playing in the Cleveland infield. From a team’s perspective, though, a run saved is a run saved, and who cares whether it’s credited to the defense, the pitcher, or split between the two? If Jarrod Dyson catches the balls sent his way, it’s good to have a pitcher who’s liable to have balls hit to him. In a nutshell, a player’s value to his team (or another team) is derived from the FIP and the FDP, and focusing on the FIP misses some of that. Put your players in the best position for them to succeed, as the philosophy often attributed to Earl Weaver goes. Doing more nuanced contextual analysis of the sort I’m advocating is quite tricky and is beyond my (or most people’s) ability to do quickly with the numbers we currently have available. I’d still love, though, to see more of it, with two things in particular crossing my mind. The second is basically expanding what we think of as being park and defensive adjustments. This is likely impossible to do precisely without more data, but I’d love to see batted ball data used to get a bit more granular in the adjustments; for instance, dead pull hitters should be adjusted differently from guys who use the whole field. This isn’t anything new—it’s in the FanGraphs page explaining park factors—but it’s something that occasionally gets swept under the rug. One thing I haven’t seen that I’d love for someone to try is for teams with roughly interchangeable fourth, fifth, and sixth starters to juggle their pitching assignments each time through the order to get the best possible matchups with respect to park, opponent, and defense. Ground ball pitchers pitch at Comiskey, for instance, and fly ball pitchers start on days when your best outfield is out there. I don’t know how big the impact is, so I don’t want to linger on this point too much, but it seems odd that in the era of shifting we don’t discuss day-to-day adjustments very much. And that’s all that I’m talking about with this. Defense- and park-adjusted statistics are incredibly valuable tools, but they don’t get you all the way there, and that’s an important thing to keep in mind when you start doing nuanced analyses. This entry was posted in Baseball, Musings, Strategy and tagged DIPS, FIP, Pitching, pitching statistics on July 10, 2014 by clownhypothesis. Fielding Independent Pitching (FIP) is a popular alternative to ERA predicated on a pitcher’s strikeout, walk, and home run rates. The extent to which pitchers deserve credit for having FIPs better or worse than ERAs is something that’s poorly understood, though it’s usually acknowledged that certain pitchers do deserve that credit. Given that some of the non-random difference can be attributed to where a pitcher plays because of defense and park effects, I look at pitchers who change teams and consider the year-over-year correlation between their ERA-FIP differentials. I find that the correlation remains and is not meaningfully different from the year-over-year correlation for pitchers that stay on the same team. However, this effect is (confusingly) confounded with innings pitched. After reading this Lewie Pollis article on Baseball Prospectus, I started thinking more about how to look at FIP and other ERA estimators. In particular, he talks about trying to assess how likely it is that a pitcher’s “outperforming his peripherals” (scare quotes mine) is skill or luck. (I plan to run a more conceptual piece on that FIP and other general issues soon.) That also led me to this FanGraphs community post on FIP, which I don’t think is all that great (I think it’s arguing against a straw man) but raises useful points about FIP regardless. Now, this is dramatically oversimplifying things—for one, FIP, despite its name, is going to be affected by defense and park effects, as the FanGraphs post linked above discusses, meaning there are multiple moving parts in this analysis. There’s also the possibility that there’s either selection bias (pitchers who change teams are different from those who remain) or some treatment effect (changing teams alter’s a pitcher’s underlying talent). Overall, though, I still think it’s an interesting question, though you should feel free to disagree. I used as data all consecutive pitching seasons of at least 80 IP since 1976. I’ll have more about the inning cutoff in a little bit, but I chose 1976 because it’s the beginning of the free agency era. I said that a pitcher changed teams if they played for one team for all of season 1 and another team for all of season 2; if they changed teams midseason in either season, they were removed from the data for most analyses. I had 621 season pairs in the changed group and 3389 in the same team group. Looking at year-to-year correlations without adjusting for anything else is a very blunt way of approaching this problem, so I don’t want to read too much into a null result, but I’m still surprised—I would have thought there would be some visible effect. This still highlights one of the problems with the term Fielding Independent Pitching—the fielders changed, but there was still an (extremely noisy) persistent pitcher effect, putting a bit of a lie to the term “independent” (though as before, there are a lot of confounding factors so I don’t want to overstate this). At some point, I’d like to thoroughly examine how much of this result is driven by lucky pitchers getting more opportunities to keep pitching than unlucky ones, so that’s one for the “further research” pile. As I suspected above, there’s something different about pitchers who change teams compared to those who don’t. The average pitcher who didn’t change teams had an E-F of -0.10, meaning they had a better ERA than FIP. The average pitcher who did change teams had an E-F of 0.05, meaning their FIP was better than their ERA. The swing between the two groups is thus 0.15 runs, which over a few thousand pitchers is pretty big. There’s going to be some survivorship bias in this, because having a positive ERA-FIP might be related to having a high ERA, which makes one less likely to pitch 80 innings in the second season and thus more likely to drop out of my data. Regardless, though, that’s a pretty big difference and suggests something odd is happening in the trade and free agency markets. There’s a strong correlation between innings pitched in both year 1 and year 2 and E-F in year two for both groups of pitchers. Specifically, each 100 innings pitched in year 1 is associated with a 0.1 increase in E-F in year 2, and each 100 innings pitched in year 2 is associated with a 0.2 decrease in E-F in year 2. I can guess that the second one is happening because lower/negative E-F is going to be related to low ERAs, which get you more playing time, but I find the first part pretty confusing. Anyone who has a suggestion for what that means, please let me know. So, what does this all signify? As I said before, the result isn’t what I expected, but when working with connections that are this tenuous, I don’t think there’s a clear upshot. This research has, however, given me some renewed skepticism about the way FIP is often employed in baseball commentary. I think it’s quite useful in its broad strokes, but it’s such a blunt instrument that I would advise being wary of people who try to draw strong conclusions about its subtleties. The process of writing the article has also churned up some preexisting ideas I had about FIP and the way we talk about baseball stats in general, so stay tuned for those thoughts as well. This entry was posted in Baseball, Oddities, Research and tagged correlations, DIPS, FIP, Pitching, pitching statistics on July 3, 2014 by clownhypothesis. One of the things that I occasionally get frustrated by in sports statistics is the focus on estimates without presenting the associated uncertainty. While small sample size is often bandied about as an explanation for unusual results, one of the first things presented in statistics courses is the notion of a confidence interval. The simplest explanation of a confidence interval is that of a margin of error—you take the data and the degree of certainty you want, and it will give you a range covering likely values of the parameter you are interested in. It tacitly includes the sample size and gives you an implicit indication of how trustworthy the results are. One big caveat I want to mention before I get into my application of this principle is that there are a lot of assumptions that go into producing these mathematical estimates that don’t hold strictly in baseball. For instance, we assume that our data are a random sample of a single, well-defined population. However, if we use pitcher data from a given year, we know that the batters they face won’t be random, nor will the circumstances they face them under. Furthermore, any extrapolation of this interval is a bit trickier, because confidence intervals are usually employed in estimating parameters that are comparatively stable. In baseball, by contrast, a player’s talent level will change from year to year, and since we usually estimate something using a single year’s worth of data, to interpret our factors we have to take into account not only new random results but also a change in the underlying parameters. 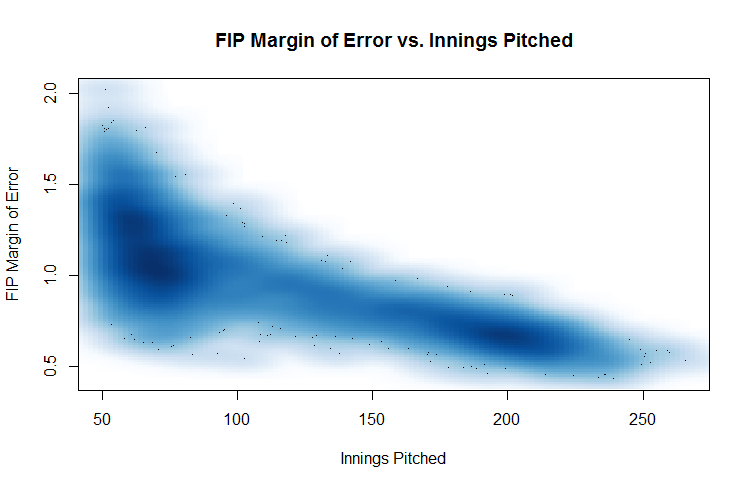 For this post, I wanted to look at how much margin of error is in FIP, which is one of the more common sabermetric stats to evaluate pitchers. It stands for Fielding Independent Pitching, and is based only on walks, strikeouts, and home runs—all events that don’t depend on the defense (hence the name). It’s also scaled so that the numbers are comparable to ERA. For more on FIP, see the Fangraphs page here. One of the reasons I was prompted to start with FIP is that a common modification of the stat is to render it as xFIP (x for Expected). xFIP recognizes that FIP can be comparatively volatile because it depends highly on the number of home runs a pitcher gives up, which, as rare events, can bounce around a lot even in a medium size sample with no change in talent. (They also partially depend on park factors.) xFIP replaces the HR component of FIP with the expected number of HR they would have given up if they had allowed the same number of flyballs but had a league average home run to fly ball ratio. Since xFIP already embeds the idea that FIP is volatile, I was curious as to how volatile FIP actually is, and how much of that volatility is taken care of by xFIP. To do this, I decided to simulate a large number of seasons for a set of pitchers to get an estimate for what an actual distribution of a pitcher’s FIP given an estimated talent level is, then look at how wide a range of results we see in the simulated seasons to get a sense for how volatile FIP is—effectively rerunning seasons with pitchers whose talent level won’t change, but whose luck will. To provide an example, say we have a pitcher who faces 800 batters, with a line of 20 HR, 250 fly balls (FB), 50 BB, and 250 K. We then assume that, if that pitcher were to face another 800 batters, each has a 250/800 chance of striking out, a 50/800 chance of walking, a 250/800 chance of hitting a fly ball, and a 20/250 chance of each fly ball being a HR. Plugging those into some random numbers, we will get a new line for a player with the same underlying talent—maybe it’ll be 256 K, 45 BB, and 246 FB, of which 24 were HR. From these values, we recompute the FIP. Do this 10,000 times, and we get an idea for how much FIP can bounce around. For my sample of pitchers to test, I took every pitcher season with at least 50 IP since 2002, the first year for which the number of fly balls was available. I then computed 10,000 FIPs for each pitcher season and took the 97.5th percentile and 2.5th percentile, which give the spread that the middle 95% of the data fall in—in other words, our confidence interval. One thing to realize is that these confidence intervals needn’t be symmetric, and in fact they basically never are—the portion of the confidence interval above the pitcher’s actual FIP is almost always larger than the portion below. For instance, in 2011 Bartolo Colon had an actual FIP of 3.83, but his confidence interval is (3.09, 4.64), and the gap from 3.83 to 4.64 is larger than the gap from 3.09 to 3.83. The reasons for this aren’t terribly important without going into details of the binomial distribution, and anyhow, the asymmetry of the interval is rarely very large, so I’m going to use half the length of the interval as my metric for volatility (the margin of error, as it were); for Colon, that’s (4.64 – 3.09) / 2 = 0.775. As a side note, I was concerned when I first got these numbers that the intervals are too wide and overestimate the volatility. Because we can’t repeat seasons, I can’t think of a good way to test volatility, but I did look at how many times a pitcher’s FIP confidence interval contained his actual FIP from the next year. There are some selection issues with this measure (as a pitcher has to post 50 IP in consecutive years to be counted), but about 71% of follow-up season FIPs fall into the previous season’s CI. This may be a bit surprising, as our CI is supposed to include the actual value 95% of the time, but given the amount of volatility in baseball performance due to changes in skill levels, I would expect to see that the intervals diverge from actual values fairly frequently. Though this doesn’t confirm that my estimated intervals aren’t too wide, the magnitude of difference suggests to me it’s unlikely that that is our problem. Given how sample sizes work, it’s unsurprising that the margin of error decreases substantially as IP increases. Unfortunately, there’s no neat function to get volatility from IP, as it depends strongly on the values of the FIP components as well. If we wanted to, we could construct a model of some sort, but a model whose inputs come from simulations seemed to me to be straying a bit far from the real world. As I only want to see a rule of thumb, I picked a couple of round IP cutoffs and computed the average margin of error for every pitcher within 15 IP of that cutoff. The 15 IP is arbitrary, but it’s not a huge amount for a starting pitcher (2–3 starts) and ensures we can get a substantial number of pitchers included in each interval. 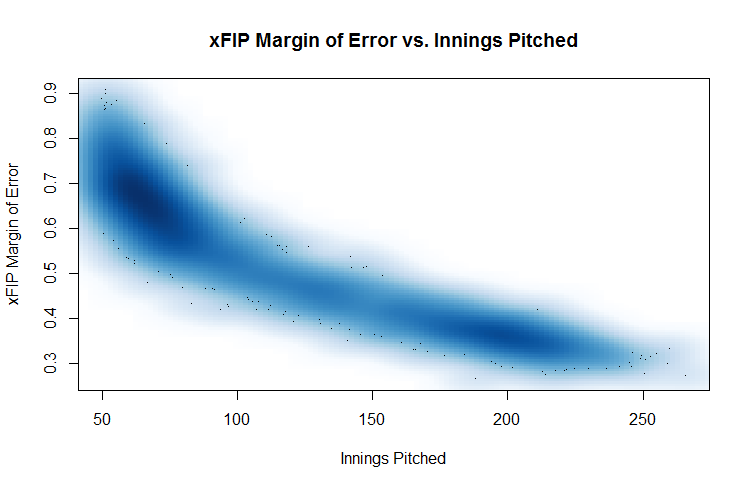 The average FIP margin of error for pitchers within 15 IP of the cutoffs is presented below; beneath that is are scatterplots comparing IP to margin of error. Note that due to construction I didn’t include anyone with less than 50 IP, and the most innings pitched in my sample is 266, so these cutoffs span the range of the data. I also looked at the median values, and there is no substantive difference. This post has been fairly exploratory in nature, but I wanted to answer one specific question: given that the purpose of xFIP is to stabilize FIP, how much of FIP’s volatility is removed by using xFIP as an ERA estimator instead? Finally, here is the above table showing average margins of error by IP, but this time with xFIP as well; note that the differences are all in the 42-48% range. Thus, we see that about 45% of the FIP volatility is stripped away by using xFIP. I’m sort of burying the lede here, but if you want a firm takeaway from this post, there it is. I want to conclude this somewhat wonkish piece by clarifying a couple of things. First, these numbers largely apply to season-level data; career FIP stats will be much more stable, though the utility of using a rate stat over an entire career may be limited depending on the situation. Second, this volatility is not something that is unique to FIP—it could be applied to basically any of the stats that we bandy about on a daily basis. I chose to look at FIP partially for its simplicity and partially because people have already looked into its instability (hence xFIP); in the future, I’d like to apply this to other stats as well; for instance, SIERA comes to mind as something directly comparable to FIP, and since Fangraphs’ WAR is computed using FIP, my estimates in this piece can be applied to those numbers as well. Third, the diminished volatility of xFIP isn’t necessarily a reason to prefer that particular stat. If a pitcher has an established track record of consistently allowing more/fewer HR on fly balls than the average pitcher, that information is important and should be considered. One alternative is to use the pitcher’s career HR/FB in lieu of league average, which gives some of the benefits of a larger sample size while also considering the pitcher’s true talent, though that’s a bit more involved in terms of aggregating data. Even if you think FIP estimates a pitcher’s true talent level accurately, random variation means that there’s a lot of volatility in the statistic. If you want a rough estimate for how much volatility there is, see the tables above. Using xFIP instead of FIP shrinks the margin of error by about 45%. This is not an indictment of FIP as a stat, but rather a reminder that a lot of weird stuff can happen in a baseball season, especially for pitchers. This entry was posted in Baseball and tagged FIP, Pitching, SImulations on March 7, 2014 by clownhypothesis.